In today’s dynamic environment, nonprofits need business models that can evolve quickly to changing community needs. To be sustainable, leaders must make strategic decisions with or without a strategic plan in place. The matrix map is an engaging tool that turns an organization’s business model into a dynamic visual integrating the mission impact and financial viability of the organization. Beyond just a picture though, the matrix map offers strategic inquiries for board and staff to frame choices and make the necessary and, at times difficult, adjustments to strengthen sustainability. The business model encompasses not only how the organization generates revenue, but also how it allocates its resources to accomplish its mission. Therefore, to visualize our business model we start by looking at each of our activities on both financial profitability and mission impact. The matrix is then broken into four quadrants with a differing strategy for each quadrant to strengthen the business model. 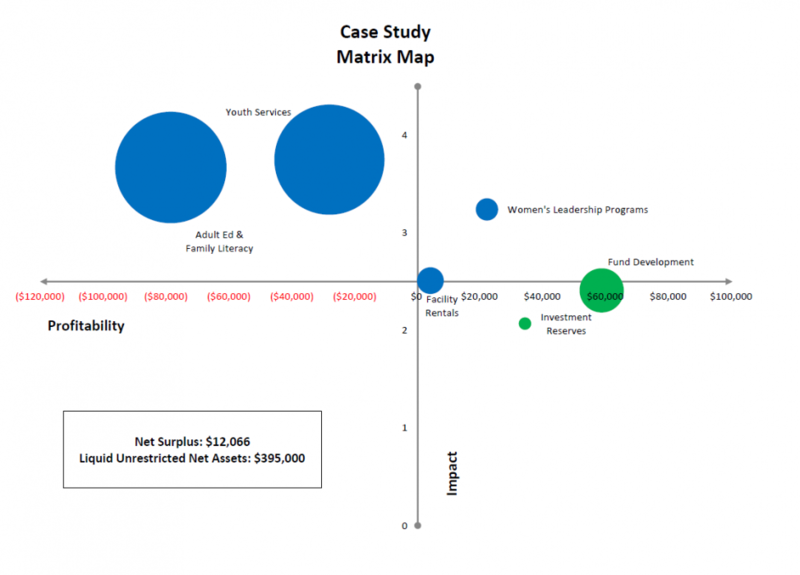 The matrix map is created by assessing the mission impact and profitability of each mission-specific and fund development program. The activities are then plotted on the matrix according to the assessment. The resulting image paints a picture of the organization’s current business model, showing how the organization achieves impact while remaining financially viable. The bubble size represents the expenses for each program. From the map you can see where the organization is generating revenue, where the organization is allocating resources and which of the organization’s activities are having impact. How these activities inter-relate is what determines the sustainability of the organization. Explain the concepts of sustainability, the nature of nonprofit business models and how their activities work together to create a sustainable organization. Prepare a basic matrix map, a visual tool for depicting an organization’s business model. Analyze their business model and articulate the strategic inquiries to strengthen it based on the matrix map. The workshop provides participants with a more in-depth understanding of the matrix map process. It includes all elements of the three hour workshop, including the framework for how to create a matrix map. However, with more time, participants will actually mock up a matrix map. This map may simply serve as a starting point, but participants will have engaged in the process and be better positioned to lead the process in their own organization. In addition to the previous learning objectives, participants will be able to apply what they learn in the session, and identify preliminary strategic inquiries to strengthen their organization’s business model. Our most intensive offering, the multi-day clinic provides participating organizations with an in-depth analysis of their agency-specific matrix map and the ability to make strategic decisions to strengthen their business model. The multi-day clinic is structured with time between workshops (1, 2, or 3 weeks) for organizations to compile finances and conduct a mission impact assessment. Spectrum is available for coaching in between sessions for support implementing the tools. Then, after the data is collected, Spectrum consultants prepare a matrix map for participants and lead them through the process of identifying strategic inquiries and making recommendations for strengthening their business model. This clinic can also be done on consecutive days working with a team from each organization in a hands-on process that culminates in a matrix map and strategic inquiries to strengthen the organization’s sustainability. Explain how an organization’s activities interact to create impact and financial viability and the role of strategic decision-making. 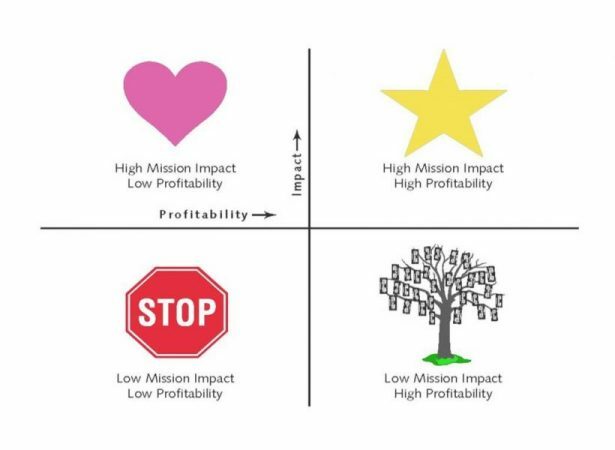 Create a matrix map, a visual representation of their organization’s business model including classifying programs and then assessing mission impact and determining profitability for each activity. 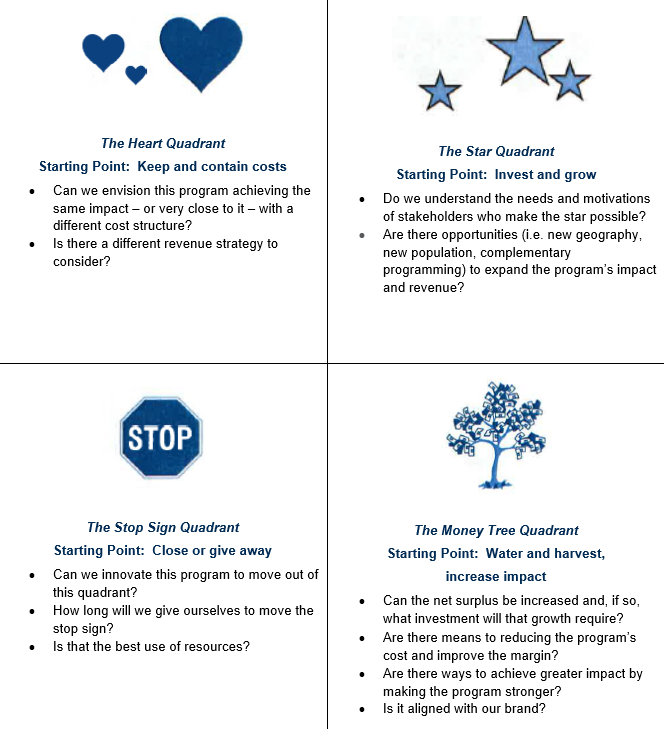 Identify the strategic imperatives for their organization’s programs and decide on priorities. Engage board and staff in a strategic discussion about the direction of their organization and how each activity contributes to the sustainability of their organization. Let's start a discussion and see if we're a good fit for your needs.